Thank you fans, friends and family for your prayers, well wishes and support. I will be ok. I will be back. He also told reporters in Kansas City “I’m not going out like this.” The under-covered part of this story is not the torn ACL but the addition of the meniscus damage, which Rivera originally knew about, but the Yankees did not. Interestingly-timed piece in the New York Daily News. At the risk of further turning major league baseball pitchers into the equivalents of the pampered and petrified thoroughbred race horses – don’t the Yankees have somebody to shag fly balls forMariano Rivera? In considering the implications of his likely torn Anterior Cruciate Ligament in his right knee, it is important to remember that since his days in the low minors, Rivera has included in his pre-game routine fairly vigorous pursuit of batting practice shots. But something then-manager Joe Torre said in 2006 is just as important. Somebody was looking at the Yankees’ lack of outfield depth and wondered if Derek Jeter might be an option in center, and Torre noted that while Jeter would survive there, the man on the team who was easily his best defensive center fielder was Rivera. Torre’s observation was spoken seriously – Rivera has a great ability to read a fly ball, and is a terrific athlete – but it was not supposed to be taken seriously. But the New York newspapers did, and I actually called Torre to ask him about their extrapolations that this was a hint that Rivera was now somehow the greatest closer of all time and an emergency outfielder. But the disturbing, harrowing video of Rivera’s injury suggests he was in fact doing something that could be considered reckless, or at least slightly so. Just before his knee buckled, Rivera can be seen stretching his glove arm back over his body in a way he would not ordinarily do during a game, while simultaneously leaping. Can you trust pitchers not to jump, not to feel they have to catch that fly ball that’s just out of their grasp? Can you trust 42-year old future Hall of Famers not to? Rivera told reporters in Kansas City that if he had to be injured, at least it happened while he was doing something he enjoyed. “Shagging, I love to do. If I had to do it all over again, I would do it again. No hesitation.” He confirmed that “it’s torn” and added a detail Girardi did not mention “meniscus also.” It’s unclear the extent of any injury to the meniscus. Rivera said he had no idea if he would pitch again. But there is a responsibility to balance a player’s rituals and athleticism – and fun – and the inevitability of the clock running out. Decades ago, the Yankees moved Mickey Mantle from center to first base in hopes of preserving his knees and his career a season or two more. Even now Joe Mauer’s future – catcher, first baseman, or outfielder – is debated. And with time, we reassess what a player should and should not be allowed to do. Jim Lonborg helped to pitch the “Impossible Dream” Boston Red Sox into the World Series, and won the 1967 Cy Young Award. That winter he tore up a leg while skiing, and soon player contracts began to be peppered with clauses prohibiting them from participating in dangerous sports. 26 years later, Texas Rangers’ manager Kevin Kennedy acceded to Jose Canseco’s wishes and let him throw 33 pitches in a blowout game against the Red Sox at Fenway. By the end of another incidence of letting a player do what he wanted, the blowout was in Canseco’s elbow and he would require Tommy John surgery. And just this past winter, the New York Mets made it clear that pitcher R.A. Dickey could go ahead with his plan to climb Mount Kilimanjaro, but if he were injured, they would exercise their right to void his contract. Girardi is right: Shagging flies has always been integral to Rivera’s pre-game routine, his exercise regimen, and his simple enjoyment of baseball. But that doesn’t mean it was the right thing to do, nor the smart thing – just that nobody this good had previously sustained a potentially career-threatening injury. And Joe Torre’s rhetorical question about what would happen if Rivera were injured playing center underscores another essential element. If it had happened that way, it would at least have happened in a game, presumably for some vital or unavoidable reason, and not because a future Hall of Famer just had to throw himself off balance because his competitiveness demanded that he go all out to catch a batting practice fly ball. With Rivera’s career potentially over, will teams try to curb their pitchers’ non-essential on-field activities? The answer may lie in another question: When Kendrys Morales of the Angels sustained a devastating fractured ankle during a team celebration after his walk off grand slam two years ago this month, didn’t we all assume we had seen the end of the ‘group jump’? The world remembers Game Two of the 2000 World Series for one thing, and one thing alone: Roger Clemens throwing the shattered bat of Mike Piazza at, or near, Mike Piazza. But for me, standing at the far end of the Yankee dugout, covering the Series as part of the Fox telecast, the bat event was an asterisk to the real headline. Because that was the night that I became convinced Bobby Valentine didn’t have the slightest idea what he was doing. Lost in the Clemens saga still churning more than eleven years later, was a) the eight innings of two-hit ball he fired at the Mets (the back half of consecutive starts in which Clemens threw 17 playoff innings, gave up no runs, one hit batsman, two walks, three hits, and struck out 24 of the 58 batters he faced); b) the Mets’ incredible ninth inning rally that almost gave Clemens a no-decision; and c) Valentine’s decision during that inning, that might be the dumbest World Series managerial move since Casey Stengel completely messed up his 1960 pitching rotation. Again, the context. Mostly because of their own baserunning lunkheadedness, plus the fact that Todd Zeile’s fly ball missed being a home run by maybe eight inches, the Mets had lost the Opener of the Subway Series the night before. Now, in Game Two, Clemens had made them look nearly as bad as he had made the Seattle Mariners look eight days before. Oh, and even though Piazza thought Clemens had thrown a bat at him, neither he, nor Valentine, nor anybody else in a Met uniform had even retaliated, let alone charged the mound or anything. So as the Mets came up in the top of the 9th, down 6-0, they were as dead as Jacob Marley’s ghost in Dickens’ A Christmas Carol. Clemens had exited, stage right, to go let the adrenalin drain out of his system (along with whatever else was in there). Coming off his best major league season, Jeff Nelson was brought in to face the heart of the Mets’ order, and Joe Torre even took out David Justice for the slight defensive upgrade Clay Bellinger would represent in left. But it did not exactly go to plan. Edgardo Alfonzo led off with a sharp single to left, and Piazza promptly got some delayed revenge by putting a Nelson pitch off the pole in left to cut it to 6-2. By this point, Torre had hastily gotten Mariano Rivera up. When Robin Ventura singled to make it three straight hits to start the ninth, Rivera was summoned, and nearly blew the game on the spot. Zeile hit another one to the wall in left, with the wind holding it up just enough to reduce it to a nice jumping Bellinger catch at the fence. But Benny Agbayani singled, and with Lenny Harris up, Jorge Posada lost a Rivera cutter and the runners moved up to second and third. Harris tapped back to Rivera who got Ventura at the plate, and the Mets were down to their final out – which was when Jay Payton walloped a massive three-run bomb off Mo and all of a sudden the Yankees’ insurmountable 6-0 lead was now a 6-5 heart-stopper, with the Mets just a baserunner away from turning over the line-up and sending up sparkplug Timo Perez with the tying run on. Please remember this specific fact: the Mets were down to their last out, but having scored five in the ninth and rattled Mariano Rivera, they now had a chance – no matter how small a chance – to pull off a split at Yankee Stadium with three coming up at Shea. You may also remember that in midseason they had lost their other-worldly defensive shortstop Rey Ordonez, and had been forced to trade utility wizard Melvin Mora to Baltimore for Mike Bordick. Bobby V had already pinch-hit for Bordick an inning earlier with Darryl Hamilton, and went to his back-up shortstop, Kurt Abbott. If for some inexplicable reason Valentine now chose to leave Abbott in to face Rivera, he would be sending a lamb to the slaughter. Abbott had never seen Rivera or his cutter before. He was a lifetime .256 hitter with a .304 on-base percentage. After this night, only fourteen more major league at bats awaited him, and that was mainly because despite a pretty good glove and a deceptive slugging percentage, Kurt Abbott just wasn’t a major league hitter. What happened next was explained at the time as a simple proposition. Bobby Valentine was out of shortstops, and, after all, Abbott had hit six homers during the regular season, in only 157 at bats. That none of them had been off a righthander since August 7, and that righthander was Jason Green (18 career minor league innings), and the other dingers had come off Terry Mulholland, Brian Bohanon, Jason Bere, Alan Mills, and Jose Mercedes, and that Abbott was carrying a 7-for-37 slump, seemed to have been left out of the equation. More over, Valentine might have been out of slick shortstops, but he was hardly out of shortstops. He had at least seven defensive moves left. Joe McEwing had played four games at short for the Mets in 2000 and was still on the bench. McEwing, Matt Franco, and that night’s DH Lenny Harris had all played third during the season, and Robin Ventura could’ve easily slid over to short if the Mets had pulled off the miracle of forcing a bottom of the 9th. If that move sounded too risky, McEwing and Harris had also played second, and could have gone there with Alfonzo switching to short. Still not comfortable with pinch-hitting for Abbott? Bubba Trammell had produced a pinch two-run single the night before off Andy Pettitte. Valentine would trust Trammell enough to start him in right in the Series’ decisive game – he could have gone in to the outfield and Agbayani or Payton played first, with Todd Zeile going to third and Ventura to short. Or the same ploy could have been used with Harris, who played ten games at first for the ’00 Mets. But, no. 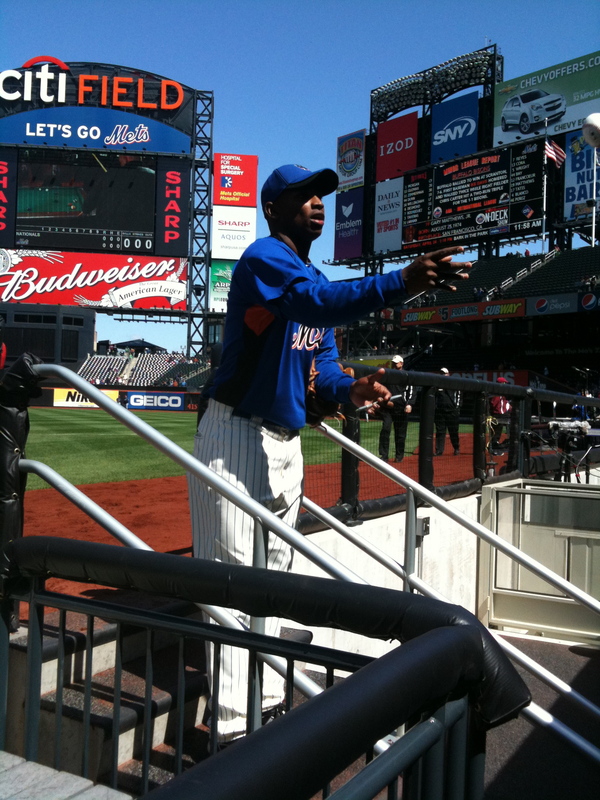 Bobby V knew he didn’t have any shortstops. So, having scored a remarkable five runs in the 9th – three of them off the greatest reliever the game would ever know – he sent up Kurt Abbott to try to finish the miracle. Imagine if the Mets had tied that game? Regardless of the outcome – even if the Yankees had promptly won it in the bottom of the inning thanks to an error by McEwing or Ventura at short or Bubba Trammell somewhere – the invincibility of the Yanks would have been punctured. Instead of a near-miss utterly overshadowed by the affair of Clemens And The Bat, it would have been the greatest ninth-inning comeback in World Series history. Instead, inevitably, Kurt Abbott struck out. Looking. The Mets lost the Series in five games, and until you just read this, it was unlikely that you remembered that “The Clemens/Piazza Game” ended with such an unlikely rally, cut short by a manager who wouldn’t pinch-hit for his good-field no-hit back-up shortstop. But Bobby Valentine is supposed to be a great in-game tactician. Just like he’s supposed to be a no-nonsense skipper who’ll instill discipline into a flabby Red Sox team – presumably teaching them to respect authority by returning to the dugout in an embarrassing disguise after he had been ejected by the umpires. Like you have to listen to the umpires or something. And don’t tell me the Abbott decision is ancient history. As far as his major league managerial career goes, the decision to let Rivera eat Abbott alive was just 326 games ago. Good luck, Red Sox fans. Your favors nor your hate. I’ve always liked that snippet from Banquo’s second speech in Act 1, Scene 3, of Shakespeare’s Macbeth. But as fans have gotten more and more aware of the minor leagues and player development, it’s become more and more applicable to baseball. Here are some images from the 1992 Fleer ProCards set of the Fort Lauderdale Yankees of the Florida State League. 20 seasons have come and gone since these kids were the future, and there were more opinions about them than each had seasons under his belt. Do you remember this guy? Second-round pick in the 1990 draft, gaunt, rangy at 6’3″, 170, with the exotic birthplace of Rotterdam, Holland. 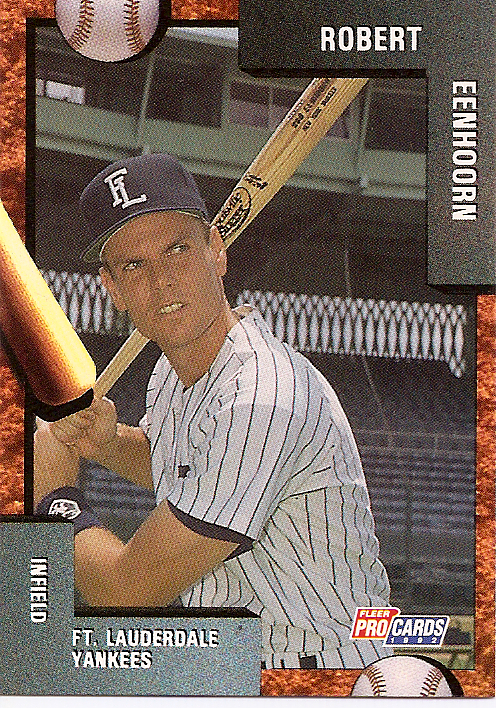 The Yankees’ shortstop of the future (as viewed from 1992)…Robert Eenhoorn? It is literally true that he was a Yankee shortstop of the future. In fact, he was the shortstop on May 28, 1995, as the Yankees beat the A’s 4-1 in Oakland. Eenhoorn went 0-for-4, lowering his season performance to 0-for-7. The next game, in Seattle, the Yankees tried another young shortstop to fill in for the injured Tony Fernandez. Jeter somebody. I was at the Expansion Draft, the November after this card was made. 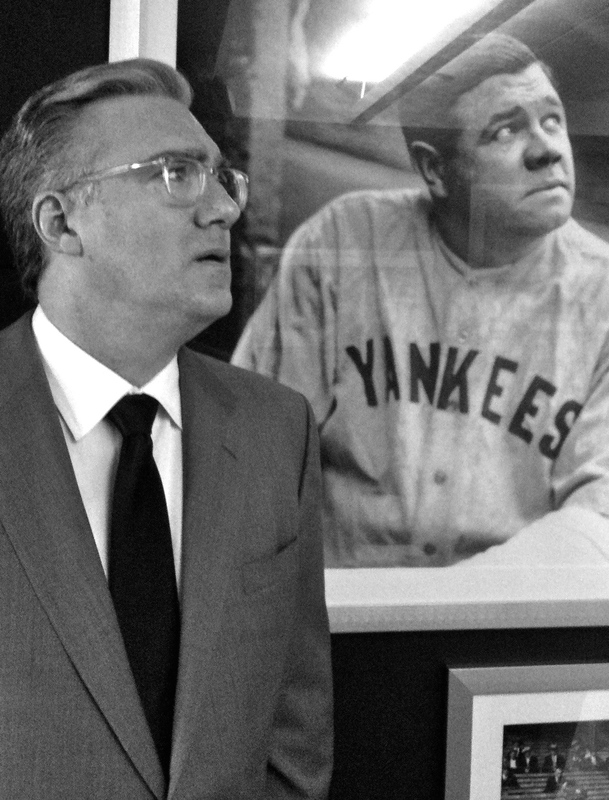 The Yankees had just lost him to Florida, and I stepped into the hotel elevator to find General Manager Stick Michael, who looked like he’d just given blood – or was expecting that George Steinbrenner would make sure it was taken from it. He lasted longer than Eenhoorn (he did 202 homers and was on a World’s Championship team in Chicago) but given the baggage he seemed to proudly carry around (he was just arrested on family violence charges last week) it seems Michael’s anxieties were unfounded. What is sadder than this? Brien Taylor was the real deal. I saw him pitch at New Britain, Connecticut. Not only have I never seen anybody throw harder, I’ve never seen anybody throw as effortlessly. His 100-MPH pitches seemed to be thrown about 5% harder than his warm-ups. You couldn’t see any of them from the stands. And then there was a brawl in a bar, and his brother was in trouble, and he went in to help him, and they tore his pitching arm to shreds. 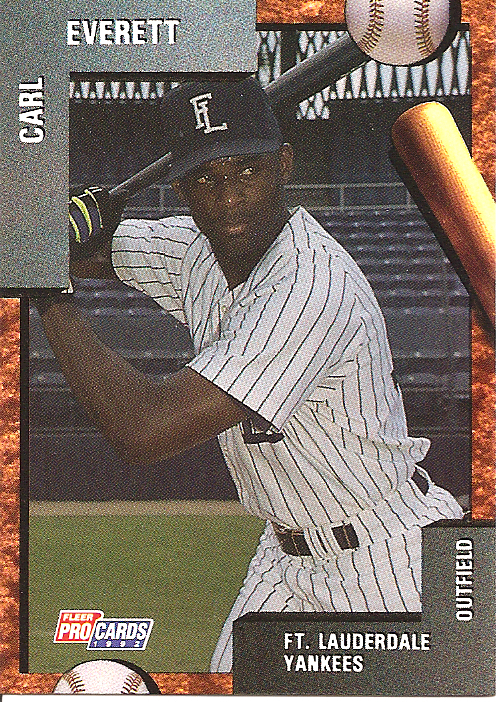 And so the star-crossed 1992 Fort Lauderdale Yankees would mostly be a tale of woe (there’s also a card of Mike Figga – he’d hit a major league home run – and of Domingo Jean – he’d win a major league game). But, if you can look into the seeds of time, and say which grain will grow and which will not, speak to me then. 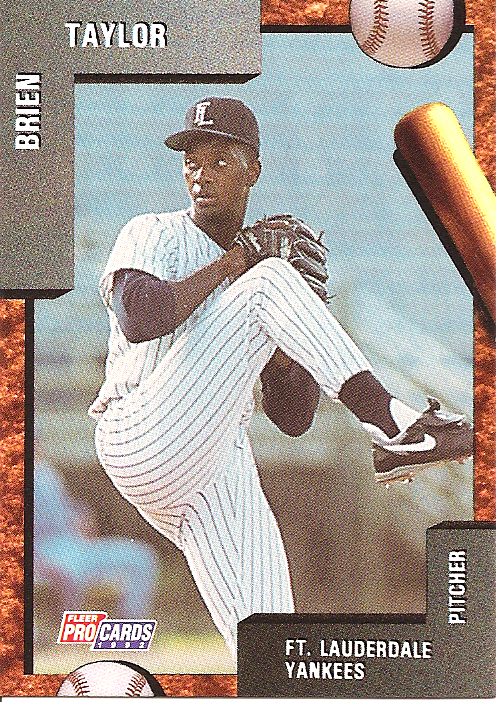 There was also this skinny pitcher – he made Eenhoorn look robust – who’d struggled in Greensboro the year before (3-4, 5.45, 52 strikeouts to 40 walks) and he’s about to hit a milestone in a career that, frankly, dwarfed everybody else who was playing in the minor leagues when this card was made (and nearly everyone who was playing in the majors). I unreservedly like Tim McCarver’s work. I have compared his analysis before the last pitch of the 2001 World Series to Mazeroski’s home run to win the 1960 World Series. For all his stylizing and odd constructions, I’ve found his game analysis, especially his “first guessing,” to be almost universally insightful and correct. But he’s dead wrong about this Joe Torre stuff. And not just for the unfortunate imagery he used during Saturday’s broadcast from Yankee Stadium at the end of the sad week in which both Bob Sheppard and George Steinbrenner died. Tim is wrong on the facts. McCarver has apologized for the imagery (you hate the Yankees? Fine. The “rooting for the Yankees was like rooting for U.S. Steel” is stern enough, we don’t have to bring Hitler and Stalin into this). But he sticks to the contention that the Yankees have “airbrushed” Torre from their history and should have retired his number by now. Let’s address the number first. Torre has been gone for only two-and-a-half seasons. Nobody else has been assigned his old uniform number 6. In examining the retirements, the Yankees have shelved fifteen numbers representing sixteen players (both Yogi Berra and Bill Dickey wore number 8). Mariano Rivera’s 42 will be automatically retired upon his departure from the Bronx, in keeping with the baseball-wide retirement of the number to honor Jackie Robinson in 1997 (and doubtless Rivera will get his own ceremony since he’s clearly earned it). Fourteen of the sixteen honorees were, at the time of their uniform retirements, either still working for the Yankees, out of baseball, or deceased. When Casey Stengel’s number 37 was put away for good in 1970, it had been a decade since he had last managed the Yankees and half of one since he had last managed the Mets. He still had a largely ceremonial vice presidency with the Mets and still suited up for short stints during spring training. Berra was managing the Mets when the number he and Dickey was retired in 1972. By then Yogi, too, had been away from the Yankees for a long time – eight years. There is some logic in delaying, especially for individuals still living. I found what is in retrospect a hilarious blog post from September, 2007, declaring that the Yankees would “surely” be one of three teams to retire the number of a veteran player: Roger Clemens. Yeah, and don’t call me Surely. Clearly the Yankees are honoring Torre by not handing his old number to anybody else. But has he been under-represented in terms of imagery at the new Stadium? McCarver acknowledged he saw some photos of his old friend in the park and did had not meant for the “airbrushed” imagery to be taken literally. I’m not sure who that is with him, but that would be Joe Torre on the left. And the idea that he is somehow being dissed by being shown back-to-the-camera denies the purpose of the photograph: each suite emphasizes the Yankees who have worn that number. 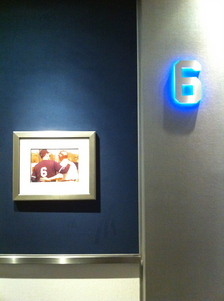 Off point, no, I do not believe there is a Suite 91 featuring nothing but photos of Alfredo Aceves. 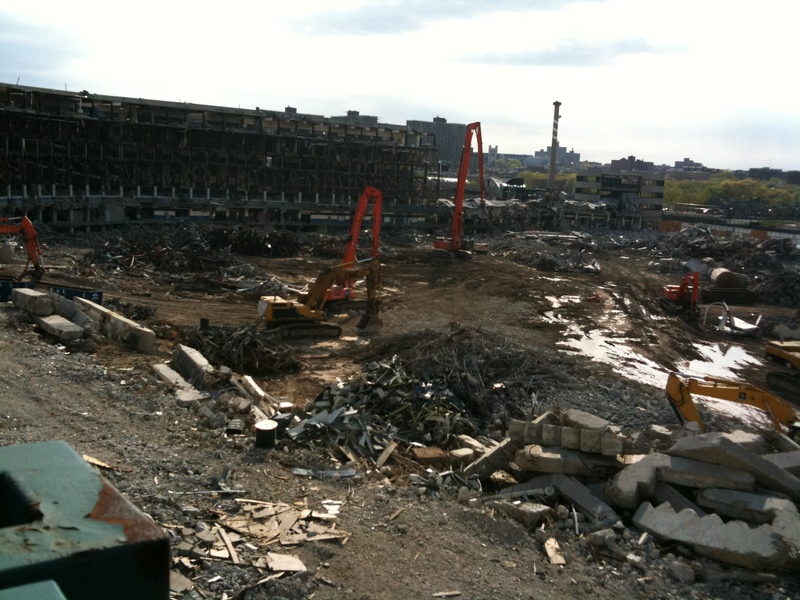 Now, the image above is a small, untitled photo, correct? Doesn’t emphasize Torre’s vast contributions to the remarkable streak of four titles in five years? Try this, from the main concourse of the stadium, behind the ground level seats, down the left field line. Prime location? Two beer stands and a men’s room? 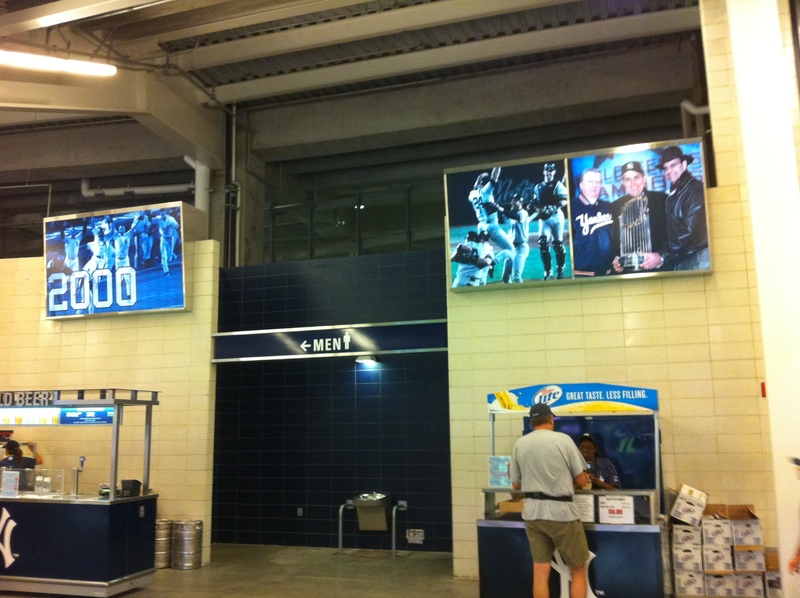 Each Yankee championship team is remembered with a three-photo display. It starts with 1923 in the farthest corner of Right Field and then moves chronologically back towards the plate and out to Left. And who are the guys in the farthest right panel? That’s right: the late George Steinbrenner, Rudolf Giuliani, and dressed for a very cold parade day from 2000, Joe Torre. I’ll repeat myself here. 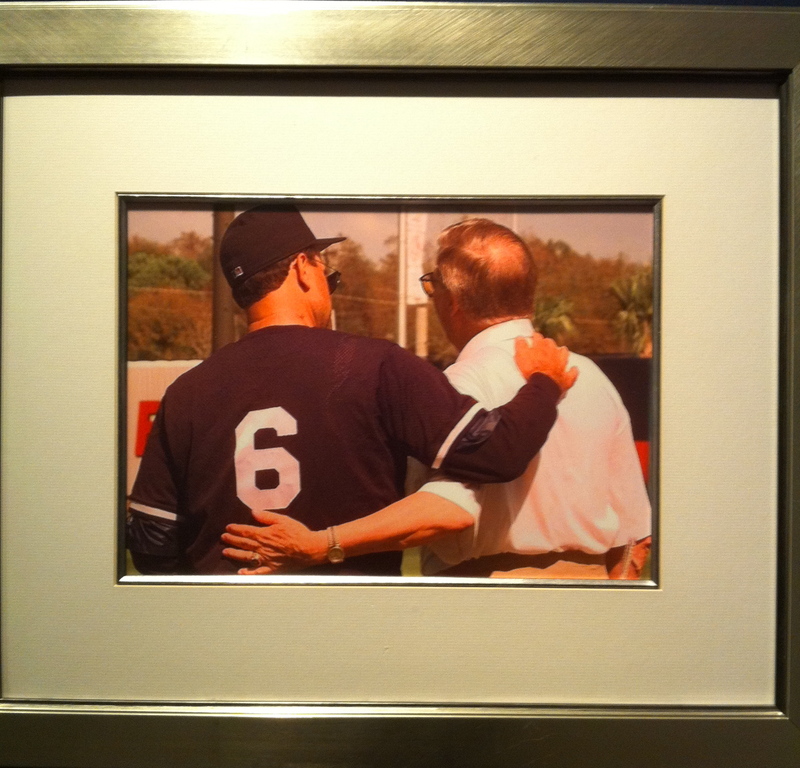 I’m a fan and friend of Tim McCarver’s, and Joe Torre is my oldest baseball friend. I’ve even worked with them both. And I know the Yankees could have done better by Joe, and his exit was unceremonious and poorly-handled by the club. I would also argue that the Yankees are the most self-important, overly-serious franchise in overtly pro sports (I can think of about 27 college programs that would at least give them a run for their money). But Timmy was just wrong, in style and in substance. 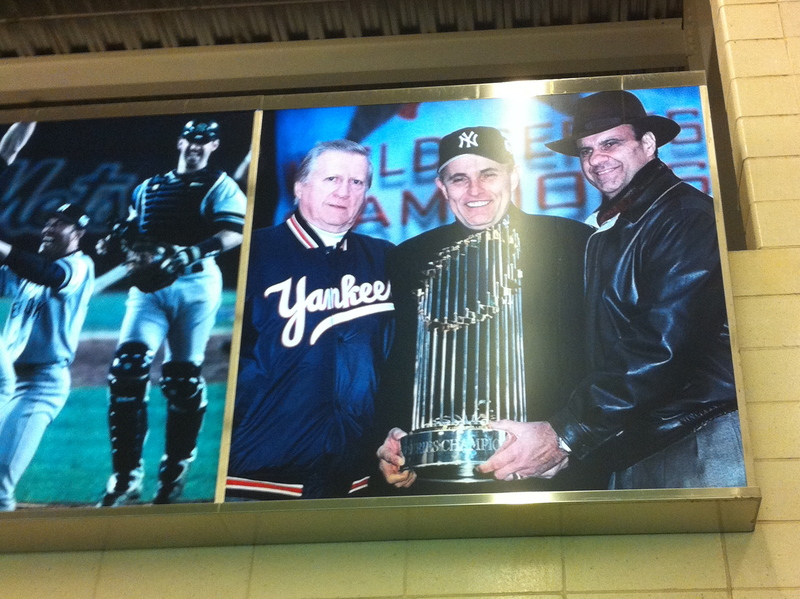 Neither literally nor figuratively have the Yankees excised, erased, airbrushed nor Memory-Hole’d Joe Torre. Doubtless the day will come soon, perhaps even while he’s still managing elsewhere, that they will formally retire the number and give him the big ceremony he deserves. To see a conspiracy in the fact that the day has yet to come is, at best, to overreact. Jayson Stark tweets that All-Star Managers Joe Girardi and Charlie Manuel were told to pick one “multi-position” player to their teams, which explains, if not excuses, the ludicrous selections of Omar Infante of Atlanta and Ty Wigginton of Baltimore. 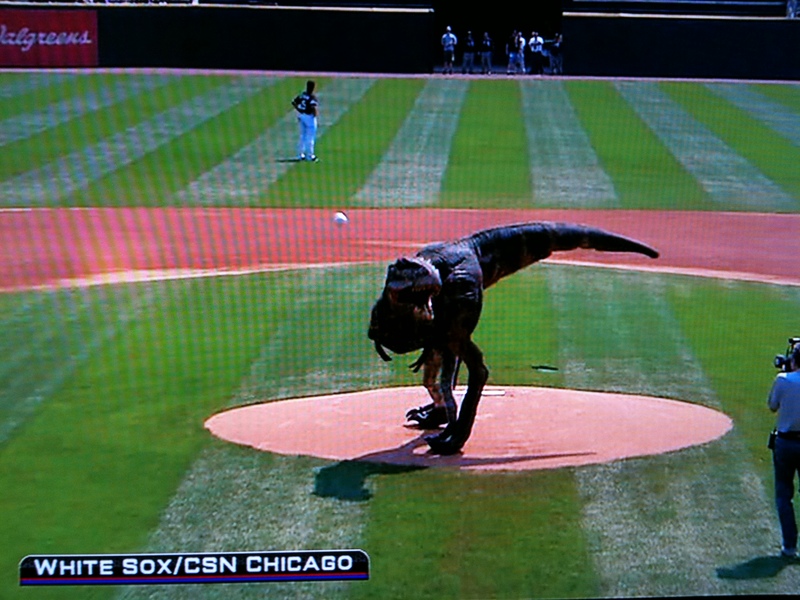 To expand on the issue of Middle Relievers, I have no problem with them. When Joe Torre put Mike Stanton on the 2001 All-Star team, many howled, I did not. But they have to be having a season that is as proportionately good as any Closer or Starter. And I don’t think Matt Thornton of the White Sox or Evan Meek of the Pirates are close to the top. Thornton is not an embarrassing pick (another tweet today suggested a good MLB scout considered him one of baseball’s top ten relievers – though I’d argue that surely at least one of the Padres’ Mike Adams, Heath Bell, or Luke Gregerson deserves to be ahead of him on that last, as does Bard of Boston, and very possibly Kuo of the Dodgers). But I went a little further into the selection of Meek and it is just indefensible. Meek has pitched brilliantly this season. Obviously leads in Pittsburgh are scarce, but not impossible: Octavio Dotel has as many Saves as Jonathan Papelbon and one more than Mariano Rivera. One can argue that an All-Star Reliever – like Evan Meek – is more valuable with the Pirates than he is with the Yankees because leads are such a precious thing. Yet though he has pitched 38 times this year, the Bucs have only used Meek twelve times when they were ahead, and only five other times when they were tied. He comes to the All-Star table with more than half of his statistics compiled in games already lost, or nearly so. Twelve appearances with a lead. Ten appearances with his team already losing by three runs or more. These just aren’t the circumstances in which the other nine All-Star relievers have had their mettle tested. That he has been spectacular in 21 meaningless games, and less so in 17 others, is a virtual disqualification for consideration. You’re a step up from factoring how well guys did in AAA this year, or on Rehab, or in the AFL last fall. Even giving him both statistics in that April 13th game against the Giants in which he inherited a runner in the sixth, then gave up a single and a groundout producing the tie run, and then becoming the pitcher of record in what was ultimately a Pittsburgh victory, Meek, “Close And Late,” is 9-7-2. It’s counted seventeen times, and he has failed on seven of those occasions, and only twice because he inherited a runner and let him score. Not only that, but the Pirates seem to be using him ‘when it counts’ less frequently as the season has worn on. Seven of his first fourteen appearances came while Pittsburgh was ahead or tied, and eleven of his first twenty-one were. Only six of his last seventeen have been. I know this reads as if I’m beating up on Evan Meek. I’m not. He’s got great natural gifts and after years of struggle, his dedication to his craft and his willingness to learn has made him a valued major leaguer. I understand about the jigsaw puzzle that is the All-Star Roster (if Andrew McCutchen is actually the Bucs’ All-Star – and he is – then Michael Bourn can’t go representing the Astros and suddenly you’re making Matt Lindstrom or Brandon Lyon an All-Star). It’s not personal (it actually startles me that Pittsburgh, in another rebuilding season, hasn’t worked him into more pressure situations; heck, I even had him on my rotisserie league team for a month earlier in the season, and I take that stuff way too seriously). But the statistics of how they are using him suggest that no matter how good he might look against an individual batter or even in an individual game, the Pirates use him as if he were the second or even third best middle reliever on their team. And when the second or third best middle reliever on the worst team in the league is an All-Star, it’s no longer the All-Star Game. My buddy and ex-colleague Rich Eisen of NFL Network asks a fascinating question. Apart from his meltdowns against Minnesota and Boston this week, Mariano Rivera has another startling skein in progress. He’s gone nineteen days without a save. Is that his personal record, at least since John Wetteland left and he inherited the closer’s role (so long ago that I was still working at ESPN)? My memory jumped to the last time we heard the “Mo’s Done” refrain, a terrible skid early in 2005. Retrosheet confirms he saved only one game between April 13 and May 9, and had none over the last seventeen days of that stretch. I have not examiner Rivera’s full career but there’s an even longer skid, and it completely escaped my recall. Mo staggered out of the gate in 2007, not recording a save in his first eight appearances, the 26 days between the opener on April 2, and his first save on the 28th. The Yankees opened the season 8-13 and at that point Rivera had… none. That’ll be tough to beat. The Necessity of Rivera underscores the Yankees’ critical problem. The age-to-depth ratio is not strong, and it is causing the team to sag. Posada, Granderson, Johnson, Swisher, Mo himself, to say nothing of the middle relievers or Javier Vazquez. Are you thinking Joba Chamberlain to close right now, if there’s another injury problem for 42? The superb symmetry did not end with two homers by Robinson Cano – named, of course, for Jackie Robinson. The Yankees were forced to get the last out in a 6-2 win over the Angels from the last man grandfathered in to wear Robinson’s uniform number 42, Mariano Rivera. 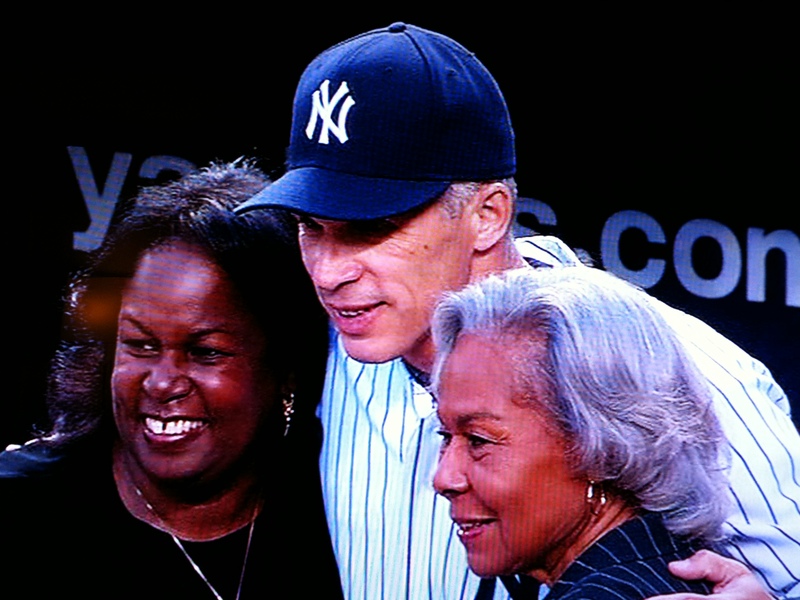 Jackie and Rachel’s daughter Sharon, on the left, with Yankee manager Joe Girardi, and Rachel on the right. I guess this one speaks for itself. Foreground, of course, the stairs from the Downtown “4” train. 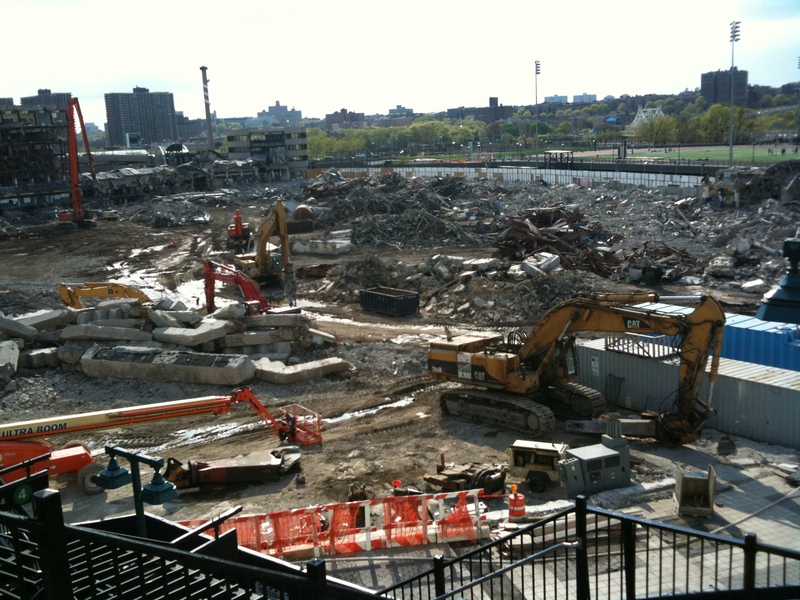 Towards the back, towards the left, the large upright object is, of course, the giant “bat” (an exhaust pipe) that still stands in what was the plaza behind home plate. It sure looks like it’s been taped up like an old fungo bat. One last note about destruction. First it was The Sporting News, discontinuing in 2008 the annual Baseball Guide (publication of which they took over from Spalding in 1941) and the annual Baseball Register (which they rolled out in ’41). Now the New York Yankees have stopped distributing “sets” of MLB media guides to non-beat writers. An annual tradition of spring has been the lugging of the ever larger of 30 books to the car (or if you’re city-bound, via subway) and then home. The beginning of the end: the Yankees are offering the guides… as a flash drive! Can we slow down? I only started tweeting last week! 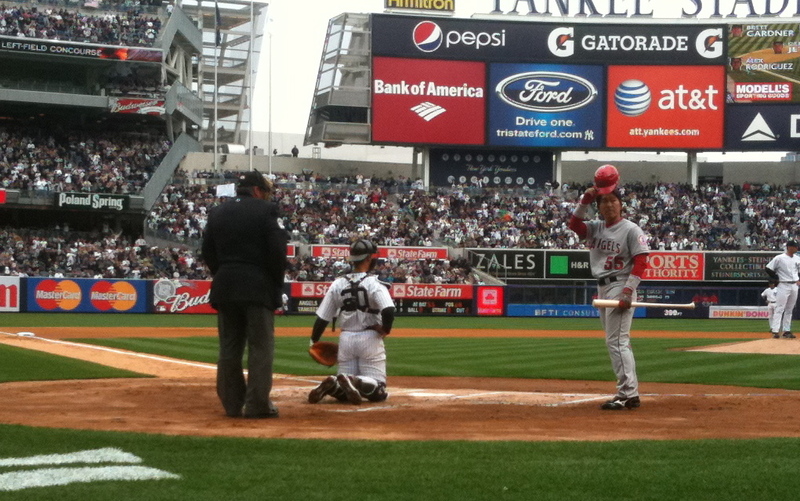 Flyovers, Steinbrenners, Bernie Williams ceremonial first pitches, Matsui’s Return – very nice events. 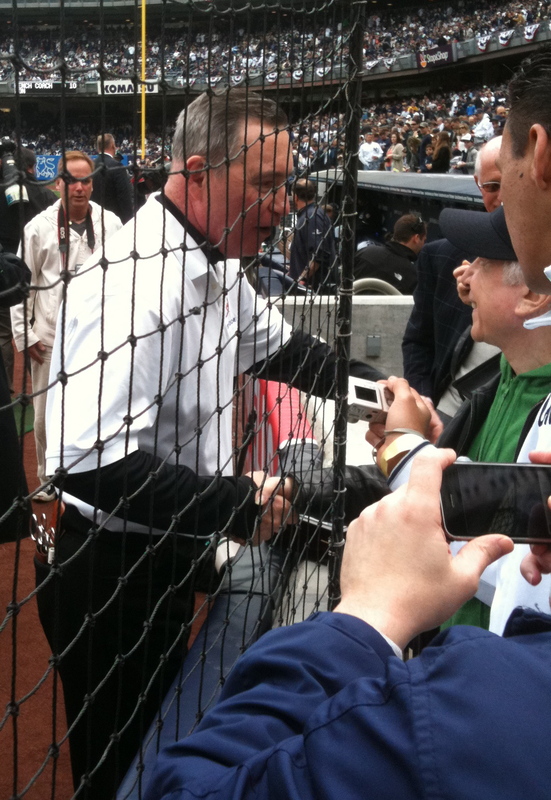 For my money, the rolling ovation for Yankees’ trainer Gene Monahan was the highlight of Opening Day in the Bronx. He confirmed today that he was been receiving treatment for throat and neck cancer – the prognosis is reportedly good – and in fact he went directly from radiation this morning, to being the first member of the 2009 World Champions to be introduced at the ring ceremony. He got a standing ovation – from the players. You need to understand about Geno, who showed off the ring and his improved health to friends like Paul Simon (left). He began working for the Yankees while still in High School, as a spring training bat boy in Fort Lauderdale, Florida. 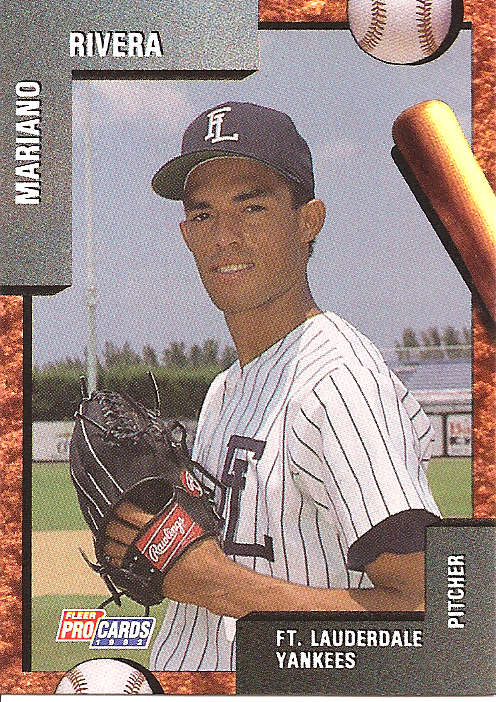 A year after graduating he was the Fort Lauderdale Yanks’ trainer. That was in 1963. Ten years later he joined the big club and has been there ever since. Indeed, it is such a stretch that he has been the Yankees’ trainer in four different home ballparks: the original 1923 Stadium, Shea, the remodeled 1976 Stadium, and the new Yankee Stadium. Gene was a Champ long before the team he trained became one, and his absence from spring training had cast a pall over the Yanks’ continuing celebration of the 2009 Championship. He is as much a part of the club as any player or any executive. They certainly do continue to celebrate. The Hideki Matsui story was terrific, of course. You may have seen his inclusion (along with Jerry Hairston of the Padres, in civvies no less) in the ceremony, and the resultant group hug, mid-field. There was also a standing ovation during his first plate appearance. Sentiment only goes so far, of course. Matsui would pop-up, on the first pitch he’d ever seen in competition from his teammate of seven years, Mariano Rivera, to end the game. Also, a happy ending to a long-ago saga. In 1996, the late, great Bill Robinson, ex-outfielder for the Yanks, Phils and Pirates, invited me to spend a game with him as his bench coach as he managed the Reading Phillies of the Eastern League. In the seventh inning, two of my “teammates” barked at the home plate umpire’s call. Blue yelled “who said that?,” they both pointed at me, and I was ejected. I went out and gave the ump a show. I told him he was obviously good enough to make the majors and when he did, I’d avenge myself on him. Well, guess who ump’d the plate today? The same man: Hunter Wendelstedt. Hadn’t seen him since. He spied me in the seats just before the first pitch and laughed, and later asked me to stop by the Umpires’ room where I was cordially welcomed by his crew chief Jerry Layne, and fellow crew members Dan Bellino and Mike Winters. 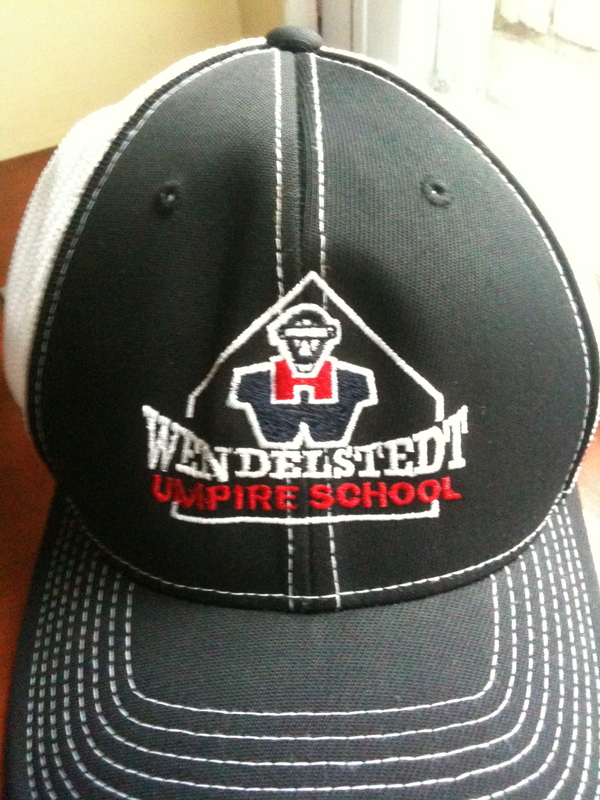 I told the ejection story in the book Dan Patrick and I wrote about SportsCenter, and Hunter actually wants me to sign his copy – in exchange for which he gave me the hat depicted for the Umpire School run by he and his father Harry, the great former NL arbiter. Hunter also noted – and it’s something for you to look for Thursday on Jackie Robinson day when all the players honor him by wearing number 42 – that the umps do the same. Fascinating to watch Jose Reyes, out nearly a year, so rusty and nervous that he stutter-stepped towards a grounder early in the Mets-Nats game Saturday afternoon, and barely made it in time to the bag on a 2-4 doubleplay. Yet by the 8th inning he was barehanding a grounder, and in the 9th, leading an abortive rally on an otherwise frustrating day for the Queens faithful. Jenrry Mejia pitched the 9th – first time I’ve seen him in person – and it was evident why the Mets succumbed to the temptation to keep him. He cannot throw a fastball that does not move, and some of them drop so alarmingly out of the strike zone that he just vaguely evokes the cutter of Mariano Rivera.